Submitted by Gordy Smiff on Sat, 05/17/2008 - 19:00. Serious question. No posers allowed. In your opinion, how good are the instruments coming out of the Mexican Fender factory ? Until recently I was using a Gibson Grabber (admittedely I'd had to convert it for a south paw, new home made nut etc) and a very nice piece of kit it was. 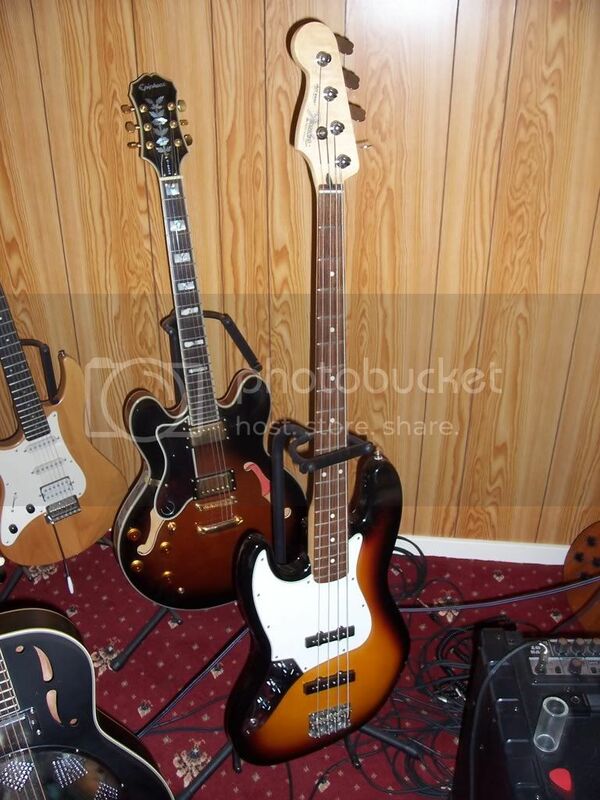 Here's a pic of my Mexican Fender Jazz. I'm impressed with it to be honest. Posted by 1bassleft on Mon, 06/02/2008 - 01:21. Sorry, Gordy. I wrote a lengthy reply last week but my computer hung up as it sent and got lost to the ether. That can really pee me off. I used a Mex 5-string Jazz for a little while and it was OK but didn't have me drooling. I would definitely avoid pre-2002 Mexican Jazzes because (weird but true) they were fitted with two neck-sized pups rather than the longer bridge. Don't know why. The later Mex's seem better made anyway. I think they're worth the money hike from a Squier more than a US Fender is worth from the Mex. For me, though, I have this quirk of liking older-style gloss necks and just recently sold an early model Fenix (made in Korea by Young Chang) and still have another one, that's defretted. Great basses, at least the ones that really looked like Fenders before the headstock shape got trademarked. Mine sold for Â£200, which was a good result for me, but I still think it was worth paying. I've spent a lot on my other one and quite happily because all the basics are very good (except the jack socket). Posted by Tim on Wed, 06/04/2008 - 19:37. Sorry, I wrote a lengthy reply last week but my computer hung up as it sent and got lost to the ether. Posted by 1bassleft on Thu, 06/05/2008 - 00:09. Posted by Gordy Smiff on Thu, 06/05/2008 - 16:23. Well, nearly 200 views and less than 10 replies, guess they're not that bad then. Posted by lee_UK on Thu, 07/10/2008 - 22:53. Posted by 1bassleft on Thu, 07/10/2008 - 23:37. Tim's in my gang now. Posted by lee_UK on Mon, 07/14/2008 - 19:41. Speaking of Gary Glitter, have you noticed how his songs are creeping back on to our airwaves? mainly as backing music on TV, won't be long before he's hosting X-Factor. Pearly what? Sh**ter? shorter? shafter? shifter? im sure you northerners make it up as you go along.